Sackville Town Council is expected to approve the purhase of a $9,500 Danish-made tricycle or “trishaw” that will be used to take Drew Nursing Home residents on special outings. Matt Pryde, manager of recreation, told councillors at their meeting last Monday that the trishaw will be fitted with a small electric motor enabling the volunteer peddling it to navigate Sackville’s hilly terrain and even ferry passengers around Beech Hill Park. Pryde said the the trishaw will be paid for partly by using a $3,700 special needs donation that has been listed as an asset on the town’s books for more than 25 years. The rest of the money will come from various sources including $1,500 from the Sackville Rotary Club, funds raised by the nursing home and a provincial grant that the town will apply for. 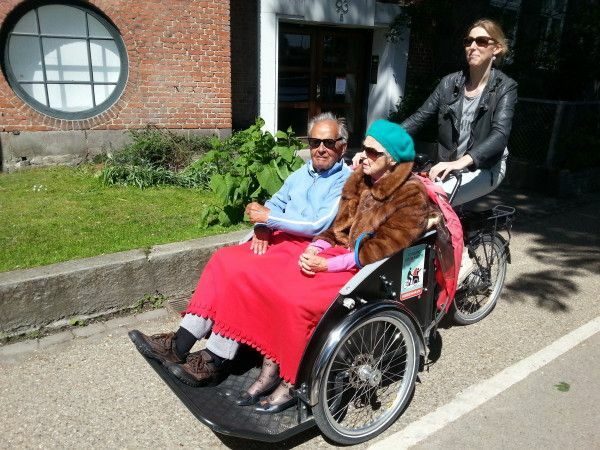 Once volunteers are trained and the trishaw hits the streets this summer, Sackville will become part of an international movement known as “Cycling Without Age.” It was founded five years ago in Copenhagen and now has 225 chapters around the world. Councillors Allison Butcher and Andrew Black welcomed the idea of purchasing the trishaw while Bill Evans said it’s not as costly as it seems given that medical equipment is “outrageously expensive.” Evans said he watched a film presentation recently at the Rotary Club where he learned that the trishaw is a type of wheelchair designed for people who are bedridden. Meantime, website developer Demian Hammock is co-ordinating a project designed to help older people on fixed incomes navigate their way through a variety of government programs. The site, called Sackville Seniors Helping Seniors, mainly focuses on the provincial rent supplement assistance program that helps people pay for affordable housing. But the new website also provides a guide to the home energy assistance program and the low-income seniors’ benefit rebate. Visitors to the site will find a variety of other resources such as information on the food bank, the Salvation Army free furniture program and the Rural Rides low-cost transportation pilot project. Hammock says he came up with the idea after talking to older people with financial worries. He adds that he’s getting help on the project from a small group of older people including a retired nurse and a former teacher. Sackville Seniors Helping Seniors appears in the “S” section of the online community directory. This entry was posted in Town of Sackville and tagged Allison Butcher, Andrew Black, Bill Evans, Demian Hammock, Drew Nursing Home, trishaw. Bookmark the permalink. It’s nice to see something positive happening in the community for a change! Such a simple idea with such amazing benefits for the elderly who are often confined within the same walls and the same thoughts day after day. Being outside lifts everyone’s spirits regardless of their ages. I hope we’ll see several trishaws on our streets soon. Well done!